The Dave Matthews Night organized by Generic Mamaw Productions was a great night to say the least. 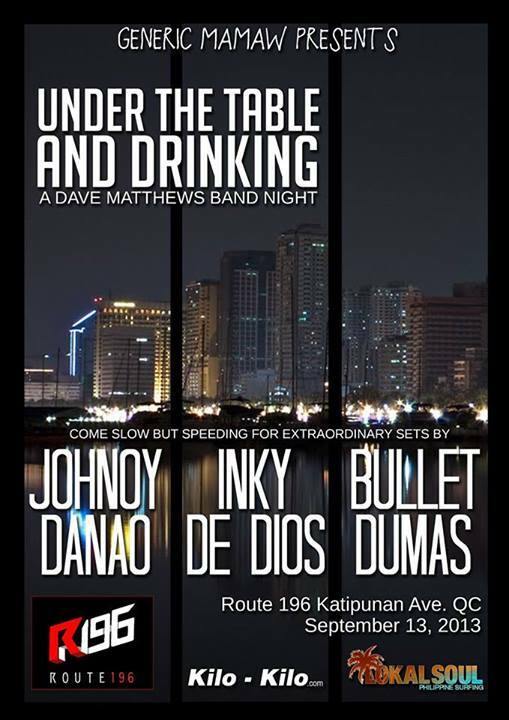 There was a lot of people inside Route 196 because of the awesome bands performing songs by the Dave Matthews band. I was lucky to become one of the media partners for this event and I am really looking forward to the next events of Generic Mamaw. Bullet Dumas was extremely impressive with their set of songs. They had a lot of us reaching for our cameras in order to take pictures. I have to give credit where credit is due and the band members playing the violin and saxophone deserve special notice. It was unfortunate I was not able to arrive on time to catch Johnoy Danao's performance. However, the performance of Inky de Dios more than made up for it. The lead singer had a nice voice and the audience were on their tiptoes to see their performance. It was one of those performances where I really envied the people who were in the front.